Tulle roses are delicate, whimsical and romantic. They can be used in a variety of pieces from a silk bouquet to a table centerpiece. Tulle is a favorite material for wedding decor, and tulle roses can also be used to dress up wedding favors or decorations. Cut a piece of tulle ribbon about one-and-a-half inches thick and ten inches long. Loosely knot one end of the tulle. 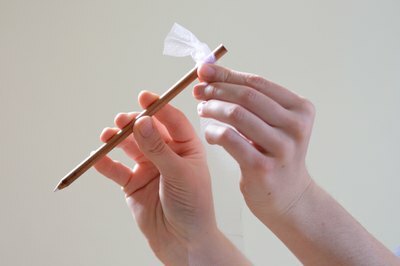 Tape the tail of the knot to a pencil, about one inch from the end. Wrap the tulle around the pencil above the knot. Keep the bottom edge of the tulle tight around the pencil, but allow the top edges to stay looser. Continue wrapping until you reach the end of the tulle. Glue the end of the tulle to the previous layer at the bottom, just above the knot. 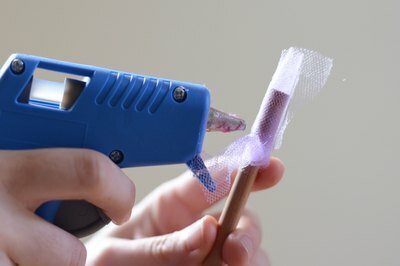 Allow the glue to dry completely before proceeding to the next step. Ease the tulle up and off of the pencil very slowly, pinching the bottom of the wrapped tulle to keep it together. 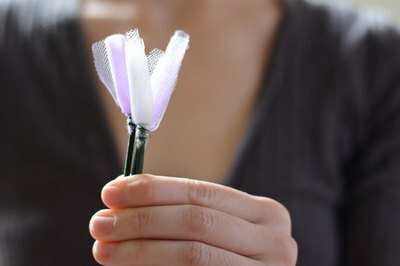 Once the tulle is off of the pencil, secure the pinched bottom of the flower with fine floral wire. 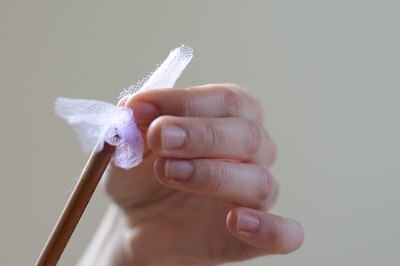 Place a hot glue in the center of the flower to hold the wrapped tulle together and create a more closed rose shape. 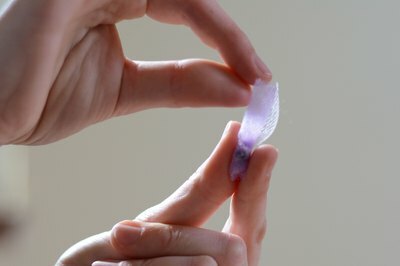 Place glue on the bottom of the wrapped section where you can see the multiple layers of tulle. Gluing in between layers will help keep the flower from becoming too loose or unraveling. Untie the knot from the end of the tulle and wrap this additional piece of tulle around the base of the flower to conceal the floral wire. Once the glue has dried completely, fan out the top of the flower to resemble a blooming rose. Use floral tape to secure the tulle rose to a stem or add silk leaves to the base of the flower. Use several of these tulle roses together in a decorative bouquet or centerpiece. Nestled among silk leaves and baby’s breath, they make a delicate and romantic piece of decor.